This drum-off will have you doing a double take! 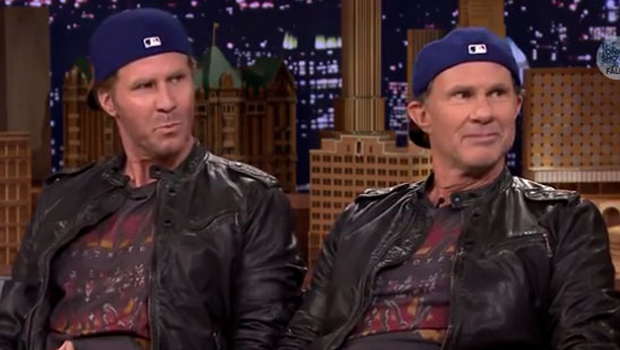 Will Ferrell and his lookalike, Red Hot Chili Peppers drummer Chad Smith, decided the best way to settle their feud was behind a drum set. The "traditional drum-off" rules allow the guys four solos, and the man who "whacks, smacks and slaps the skins the best," wins. Amid the drumming, there was quite a bit of smack talk between the guys. "Do you play for the Lukewarm Chili Peppers?" Ferrell, 46, taunted. Following his first drum solo, Smith, 52, quipped, "Take that, funnyman!" Little did the audience know but Ferrell had one last trick up his sleeve to win the battle. The Saturday Night Live alum knew what this drum-off needed, and it was more cowbell! Thursday's "Tonight Show Starring Jimmy Fallon" drum-off was for a good cause. Ferrell raised money for the Cancer for College charity, while Smith was drumming for Little Kids Rock.